* Fix for visual composer plugin. * Improved pop up banner on mobile devices. * Added Latest and Special Offer widgets. * Added option to set menu fixed position. Dignitas comes with unlimited color options you can easy cahnge them via management panel. You will be able to create your own homepage by dragging and dropping blocks also you can add Layerslider. Dignitas includes styled contact form whereby you can easy send e-mails. Dignitas theme comes with a reservation system, you will receive a email with all reservation details when a new reservation is made. 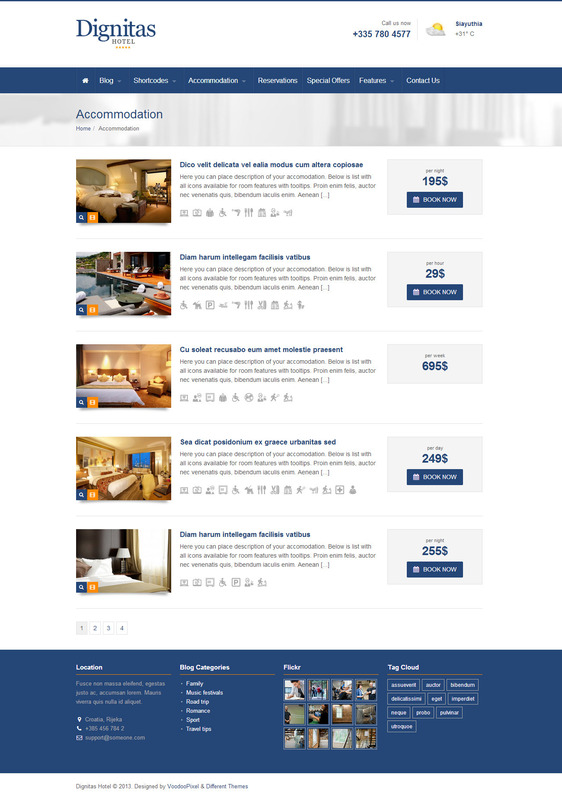 A filterable page with special offers from accommodation section. By addin accommodation you can choos if it’s a special offer or not. Dignitas theme is offered together with 11 widgets adjusted for the theme. Get the latest Weather forecast from a specified location, that you can set in management panel. We use World Weather Online API! 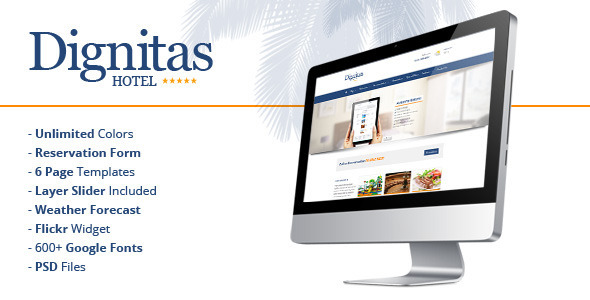 Dignitas has it’s own Bannery system, in which you can add images, text, videos or any other type of HTML code. You can add/edit all effects ( how often banners will show up, after how much seconds it will disappear, effects, fly in time e.c.). Dignitas theme includes language (POT) files – now you can browse them easier and faster. This theme is easily adjustable to other languages by using PoEdit programme which is available free. Dignitas theme contains shortcodes which can be inserted both by adding shortcode in the post field or by using specific shortcode insertion buttons which make using the shortcode much easier. 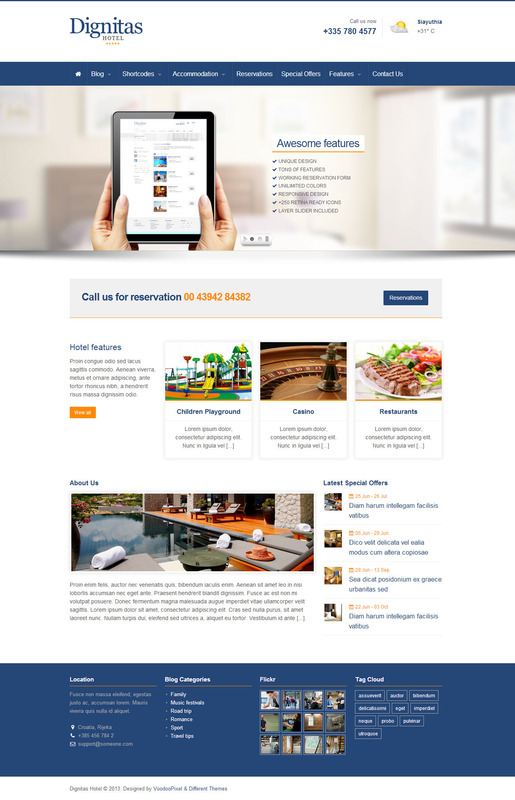 This is not only a beautiful theme, the personal customer service is the best! Over the top! Very quick to respond! I totally recommend everyone to purchase this theme. I purchased this theme a few months ago & have been extremely pleased with the customer support. Definitely money well spent! Very nice theme, it was easy to set up and it looks great! I would recommend this theme! Really great theme and support. A nice theme, easy customizable but the best is the personal atention of the creators…simply amazing. Best buy ever on themeforest with difference.